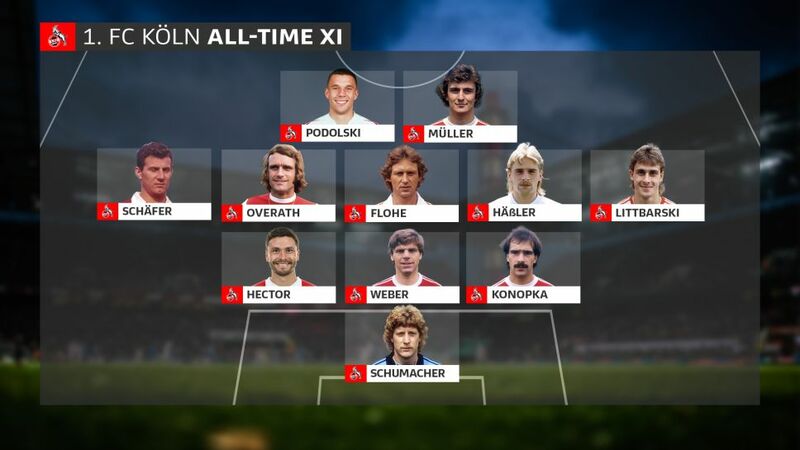 Cologne scaled the heights of the Bundesliga in the 1970s, winning a domestic double to crown the most successful era in the club's history in 1978 – a time in which they spawned not only some of Germany's, but also some of the world's greatest footballers. Recent years may have seen the Billy Goats yo-yo between the top two tiers, but many great names have nevertheless worn their colours. Cologne's current vice-president Harald Schumacher, better known as Toni, was regarded as one of the world's best goalkeepers in the 1980s, when he won the European Championship with Germany and was runner-up for his country in successive FIFA World Cups in 1982 and 1986. He had an injury to the Billy Goats' regular number one Gerhard Welz to thank for his debut at the age of 19, though, and he did not look back. Between 1977 and 1983, Schumacher spent a remarkable uninterrupted six years between the Cologne posts – a total of 213 consecutive Bundesliga matches – winning a Bundesliga and DFB Cup double in Cologne's most successful season to date. The 1984 and 1986 German Footballer of the Year earned legendary status not just among Cologne fans, but also among a wider footballing audience as one of the best goalkeepers of all time. Pierre Littbarski was studying to become a finance clerk when he earned his big break from Cologne and decided to ditch his studies. The Billy Goats could probably have done with the expertise he had acquired in the lecture hall, though, considering they spent just 13,000 Deutschmark to sign him compared to a league record one million for Roger van Gool, with Littbarski certainly proving to be the wisest buy. He struck 89 goals in 234 games, playing in an attacking midfield role, while Belgian van Gool found the back of the net just 28 times in 96 outings – as a striker. One of the most important goals of his Cologne career proved to be the decisive one in the 1-0 victory over city rivals Fortuna Köln in the 1983 DFB Cup final – his only trophy at club level, prior to winning the World Cup with Germany in 1990. Thomas 'Icke' Häßler was another of Germany's 1990 World Cup winners, although he could hardly have a more contrasting style to Littbarski's. Born, like Littbarski, in the fertile Berlin suburb of Wedding, which has also reared the likes of Niko Kovac, Antonio Rüdiger, John Brooks and Christian Ziege, Häßler honed his technique playing on the concrete yards of the underprivileged neighbourhood.